Then I switched out the cord color placement (and tweaked a few bead colors) and got this one! These bracelets scream "SUMMER" to me with: bright and colorful! I can't decide which one I like better. Do you have a favorite? This is just a quick reminder that there are only a few days left to finish your piece for the Starfish Color Palette Challenge. Photos of finished pieces need to be in by June 15th in order to be included in the blog reveal post. You can find all the details over on the Love My Art Jewelry blog. I hope you'll play along - there's still time! Yet More Beachy Macrame Jewelry! With Memorial Day behind us, it finally feels like summer is official and the Starfish Collection color palette I've been working with seems even more appropriate. 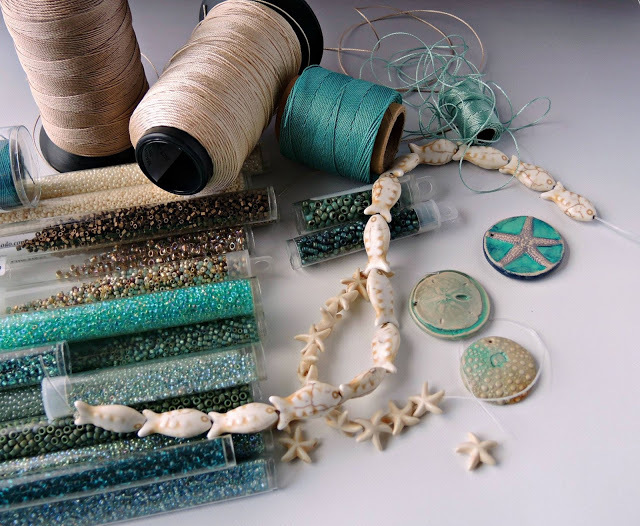 Turquoise blues mixed with sandy tans and ecru just scream beach and summer and when you throw in macrame knotting, it's a match made in heaven. 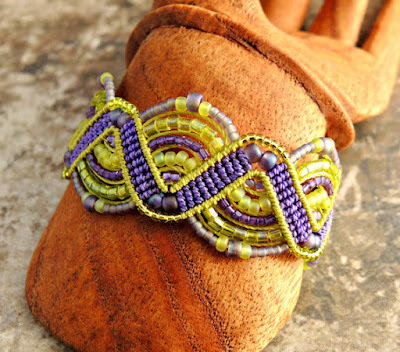 As usual, before I've even finished knotting one macrame bracelet I'm struck with an idea for another. Usually it's some variation or mutation of the one I'm working on. 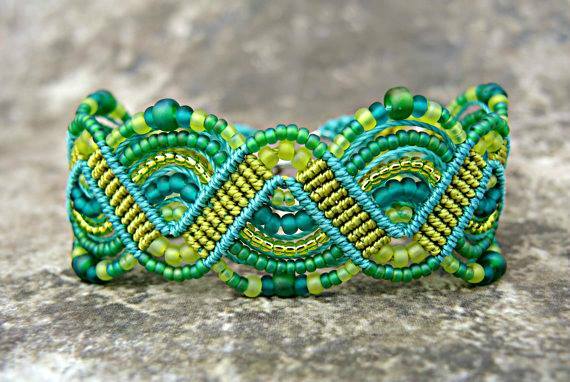 This time I started with the Woven Diamonds micro macrame bracelet in the first photo (pattern is offered as an online class on CraftArtEdu, if you want to make your own). 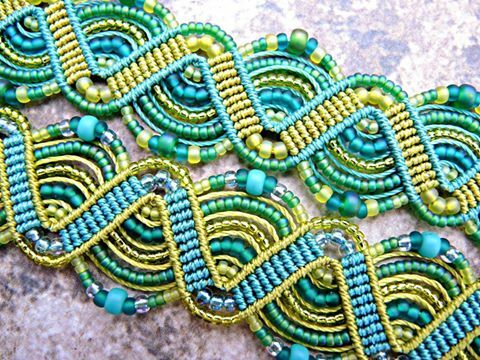 While I was making that one, I was thinking how pretty the bead mix was and how nice it would look in my Drunkards Path pattern (also an online micro macrame class at CraftArtEdu). 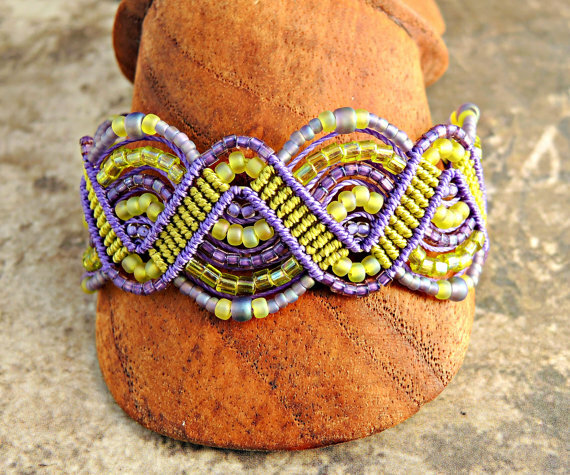 As I was working with the bead mix, I thought it would be fun to arrange them in arcs of color, so that led to another bracelet. Me being me, I couldn't leave well enough alone. I had to see what it would look like with all stripey sections. 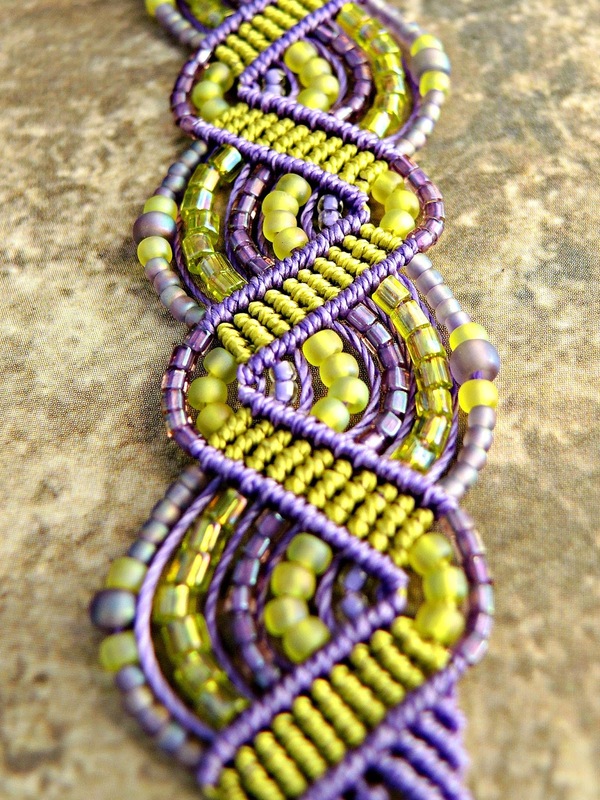 I liked the stripes up so that they undulate through the length of the bracelet. And of course I added a little starfish on the end.